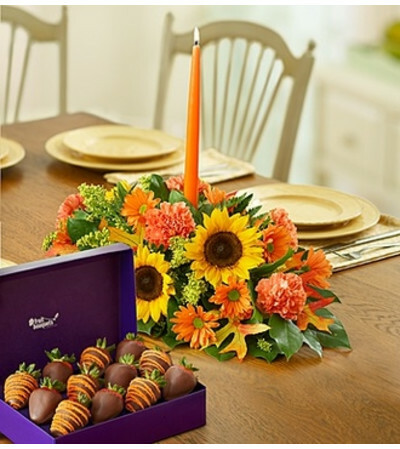 Make their celebration shine with a classic combination of our bestselling Fields of Europe™ for Fall Centerpiece arrangement and one dozen of our decadent strawberries, dipped and decorated to perfection. 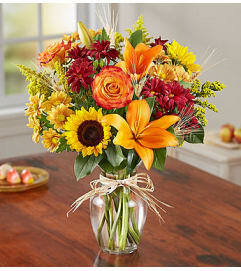 Perfect for birthdays, congratulations or "just because" they make you feel sunny inside. Hand-crafted centerpiece of roses, sunflowers, lilies, daisy poms, carnations, solidago, salal and leather leaf, accented with dried oak leaves. Features 12 strawberries: 6 dipped strawberries and 6 strawberries dipped, drizzled & decorated with orange sugar crystals. 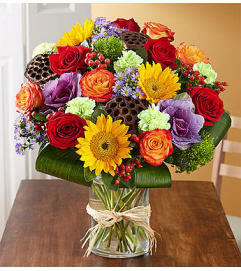 Small arrangement does not include roses or lilies.